Two books accompanied me along my journey: Die schönen Kriegerinnen, edited by Cornelia Sollfrank, and Staying with the Trouble by Donna Haraway. Wonderful conversations I had along the way with inspiring people like Spideralex and participants at /etc confirmed and reinforced the inspiration and motivation I found in these books. Once I was ready to rejoin the world of my everyday life in Linz, I found inspiration and motivation again in this world too. 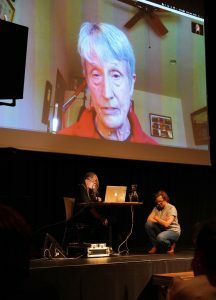 As part of the Art University series “Relatifs”, organized by Karin Harrasser and Anne von der Heiden, there was a Donna Haraway evening at the Gesellschaft für Kulturpolitik, where I even had an opportunity to personally ask Donna Haraway about her thoughts on spaces where “making kin” can be possible, because that question kept coming up in my mind in the spaces like Calafou and XM24, where I was reading her book. Although the timing didn’t work for anyone else from servus.at to go with me to /etc, of course servus.at was still here when I returned, feeling even more grateful that we are fortunate enough to still have an initiative like servus.at in Linz. There is so much to be done, so much to be written in support of servus.at, and I feel excited and motivated to be part of that. The overarching theme that accompanied me throughout my journey and all the way home was storytelling. Storytelling is a vital practice that we need, in order to counter the insistent and ubiquitous narratives of capitalism, commercialism, populism. In order to be able to create alternatives, first we have to be able to imagine them. We have to be able to describe what is wrong, in order to make something right. For that we need storytellers. Along with so many storytellers I respect and admire, both of my sons are storytellers too, for which I am deeply grateful. That means, of course, that their lives will probably never be easy, comfortable or safe, but I have nothing but the greatest admiration for the choices they have made, and I want to find ways to contribute to this effort as well. I think what I found most of all along my three-worlds-in-two weeks tour is that I need to write again. Finding myself with time to write again after retiring, at first I felt as though I had nothing left to write about, but my journey in October certainly changed that. Tomorrow is the seventh anniversary of Peter’s death. Yes, I am still counting. I have not forgotten Peter or the good life we had together, and I am grateful to all the people who do not feel uncomfortable or concerned because I still enjoy talking about him and sharing memories. I also look forward to joining him eventually – but first there is so much more I need to write. 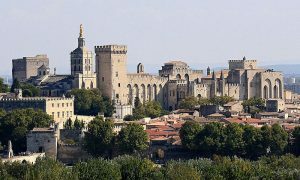 Why Avignon? I had decided to spend the last day of my trip just being a tourist in Avignon for the simple reason that a convenient train connection stopped there, and as a theologian interested in church history, I was curious. Of course, what appeared to be a convenient train connection turned out to be yet another high-speed train, and after enjoying the slow, scenic train ride from Vallebona to Barcelona together with Patrick, I was seriously annoyed by the airport-like boarding area permitting access only with a valid ticket and reservation. That meant I couldn’t really enjoy lunch with Patrick, because I had to keep watching the time to make sure I said good-bye to him in time to get through the security clearance in time to board the train, because he couldn’t accompany me to the platform to wave good-bye. Saying good-bye to Patrick is always so hard, and I resented having it made even harder. My irritation was further exacerbated when the train was late and all the passengers were left waiting in line with no information or explanation, while the staff assiduously avoided making eye contact with any of the unhappily waiting passengers. Since the train was bound for Marseilles, though, as I was standing in line I was surprised by what a relief it was to hear people around me speaking French and realize I could actually understand them, even communicate with them to some extent as we relayed information to one another about the delay, despite the appalling inadequacy of my French. Eventually the train arrived, we were all finally permitted to board, and I found my seat without further complications. At first I was disappointed to find myself sitting on the left side of the train, but that turned out not to matter. Somewhere between Girona and Perpignon, the trains seems to fly across a body of water, so the water is seen from both sides of the train. In the evening, as the sun was just setting, the water was so still it perfectly mirrored the clouds and the setting sun. Looking out the window of the train, I was entranced as the world appeared to magically turn itself upside down. When I arrived some five hours later in Avignon, I was again annoyed to find myself at the TGV train station outside the center, rather than at the main train station, which was within walking distance of my hotel. (Note to self: seriously, avoid high-speed trains in the future.) The hotel itself turned out to be absurdly elegant (and normally about four times more expensive than the rate I was paying), which I found a bit difficult to take seriously after Calafou. I confess, however, I did thoroughly enjoy being able to take a nice, long hot shower without leaving my hotel room. Avignon is obviously accustomed to and prepared for tourists. Although it is famous for its medieval architecture, it was something of a relief to see that Disneyfication has not obviously taken hold of it. And with “Sur le Pont D’Avignon” already playing incessantly in my mind, I was grateful not to hear it played anywhere outside my own head. So what does one do as a tourist for only one day in Avignon? Following the luxurious breakfast buffet in the hotel (along with the still necessary cough syrup, aspirin and ginger tea), I took a walk right through the middle of town to the famous center. Then of course I bought a combination ticket for the Palais des Papes and the famous bridge, not realizing how overwhelming the Palais des Papes would be. The education staff there has done a fantastic job of preparing accessible information for visitors in an engaging way – and I have worked with enough museum and gallery educators to recognize how much effort and expertise goes into visitor information like that, so I hope the people responsible for it received the moral and financial appreciation they certainly deserve (even though I know that almost never happens). Upon presentation of the admission ticket, each visitor was given an electronic pad on a lanyard along with clear and simple instructions in the appropriate language. All along the tour there were informative, attractively designed panels in multiple languages and benches where visitors could sit down to read these panels. Sensors in each room triggered relevant information on the pad, and in certain spots all along the way, a marked sensor in the room filled the depiction of the room on the pad with myriad ghosts of grim-looking old men in ornate robes to explain the purpose of each room and show how it presumably looked in use. I was impressed by how well the copious information was organized, but between the printed information and the digital information, I had to keep taking a step back to get a sense of where I was, a sense of the atmosphere of the rooms with all their long history. Eventually, however, I began to realize that it wasn’t just the abundance of information or the long walk that felt exhausting. The palace as a whole felt hopelessly oppressive – and yet there was something missing. Although I consider myself a critical feminist theologian, since I was raised traditionally as a Catholic, the idea of the papacy as an office of spiritual leadership is deeply ingrained. In the Palais des Papes, the Papal Palace in Avignon, however, there was no trace of that. In all that copious information, there was no mention of the significance of the pope for the Catholic Church. Power, wealth, political intrigues, treasures, luxury, worldly preeminence, chapels built for exquisite adornment, not for praying in. And as the pad repeatedly displayed, this was wholly, completely and solely a man’s world. Only one woman was ever mentioned and also depicted in a painting toward the end of the tour: Joanna, countess of Provence, who sold the city of Avignon to Pope Clement VI for 80,000 florins in 1348 to raise money for troops to defend her claim to Naples. In the painting depicting this transaction, Joanna is no Khaleesi with dragons or loyal companions, but is accompanied only by a malevolent-looking imp holding the train of her gown, surrounded by grim-looking men in ornate robes. The painting is a vivid portrayal of the humiliation of a strong woman forced to concede her power to greedy men. The triumph of patriarchy. I found it nauseating. 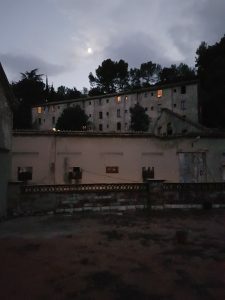 After hours and hours of wandering through the Palais des Papes, when I sat down somewhere outside for a cigarette, it was a relief to see how shabby and ramshackle the narrow little streets around the palace looked: the reverse side of power. Perhaps my impressions of Avignon might have been different, if I had been feeling better, if I hadn’t still been struggling with low energy and the suspicion that I had been wandering around with a fever all week, or perhaps I might have felt even more angry and rebellious if Avignon had turned out to be a pretty place. As it was, I found the Medieval architecture neither pretty nor romantic, but simply oppressive. Following the long tour through the Palais des Papes, I wasn’t ready for another walking tour yet, and although there were outdoor cafes everywhere, none of them tempted me to sit down and eat something, so I decided to take the little city tour train that one finds in almost every city now. Unlike most city tour trains, however, this one wasn’t bright yellow. It was gray and looked a bit dilapidated, cobbled together from leftover bits and pieces that no one had bothered to paint. That was fine with me, and I was happy enough to just sit there for an hour on the little train tootling along around the city center. Apart from the main shopping street with the usual international chain stores, there seemed to be only souvenir shops, and I eventually found the endless sacks of lavender and herbs of the Provence so depressing that I finally gave up on the idea of finding presents to take home with me. After the train, I made my way to the famous bridge, where I exchanged my combination ticket for a conventional audio guide. For an audio guide, it worked reasonably well, although I somehow had the impression that its creators had resigned themselves to the expectation that tourists are not really interested in the history of the bridge, but just want to walk out on it to take pictures of one another dancing, so they can post them to Facebook and Instagram. I didn’t feel like dancing. In the evening there was no room left in the hotel restaurant, so I ended up going to a nearby restaurant for dinner, following a recommendation from one of the young men at the reception. Even in October it was still (just) warm enough to sit outside to enjoy an excellent (albeit rather expensive) meal in a beautiful courtyard. In Vienna it would probably be regarded as “hipster”, but I didn’t really care. Even that seemed to fit with my impressions of Avignon. I’m not sorry I stopped in Avignon. On the contrary, I think the juxtaposition made me even more appreciative of the first two worlds I visited. Turning history into a tourist attraction will not help us make a good life for everyone in the long term. Well supplied with water bottles, snacks, and a bag of disgusting eucalyptus cough drops, following an early breakfast, cough syrup and aspirin at the hotel, I was ready for the thirteen-hour journey home to Linz, including changing trains only once in Frankfurt. From Avignon to Frankfurt, I was happy to be able to just sit quietly and comfortably looking out at the beautiful scenery of Provence on a lovely autumn day. The main train station in Frankfurt is no more interesting than the airport, although a bit smaller and not as glaringly bright, and the journey from Frankfurt to Linz is no more interesting by train than it is by plane. Either way, Frankfurt remains “almost, but not quite home” – journey over in any case, and the last 100 kilometers are always the longest. In the end, I was happy to be home again, where my cats were there to greet me as I can in the door. Over the next few days, the cats also urged me to accept that I was still sick and just stay wrapped in a blanket quietly on the couch or in bed, watching silly films and sleeping, so that they could take long naps on top of me. After the effort of pretending I was ok for a whole week, I was happy to accommodate them. Actually, that was probably just what I needed to make the transition back into my everyday life. Remembering the long and confusing train journey from Linz to Barcelona in 2014, with many changes and long waiting periods in between, I was most intrigued by the possibility of a more direct connection between Italy and Spain offered by ferries. Although I had reservations about the thought of traversing the mass grave of the Mediterranean Sea in a luxurious ship, I have always loved traveling by ferry and I still miss living close to the sea, so I eventually decided to make use of the further Interrail discount on a ferry ticket and take that option. Again and again, planning a trip and actually taking a trip can be so different. Connections that look comfortable and convenient turn out to be high-speed trains, which often involve special boarding areas, security checks, additional costs, numerous tunnels, which all make them barely an improvement over flying (memo to self: avoid high-speed trains on future Interrail trips). Then there is the sometimes disconcerting disconnect between online information and real-life circumstances. The lovely little port town of Civitavecchia, for instance, has a wonderful website full of useful and practical information about how to get from the train station to the ferry terminal. The town itself, however, seems to be entirely unaware of its online presence: no signs, no bus, no kiosk, no maps, no information whatsoever. A young couple helped me get my suitcase down the steps at the entrance to the station (only slightly superfluous after I had managed to get it up the steps on the other side by myself, but it was kindly meant), so at least there was someone I could ask about how to get to the port, and they pointed me in the right direction. Still no signs, no bus, no information, no shuttle – just flocks of young teenagers floating around in their pretty bubbles on a warm evening among artfully illuminated ancient buildings. After running around in increasingly desperate circles near the water for some time, I finally managed to hail a grown-up-looking figure not wearing a military uniform, hoping to be able to ask a human for assistance. This human turned out to be a cute guy, who was very charming and friendly and perfectly willing to discuss his ability to speak English at greater length with me, but when he pointed out some blue lights as the dock where the Grimaldi Lines ferry is usually to be found, I was so dismayed by the distance between those blue lights and me that I just grabbed my suitcase and started running again. I think part of the problem may have ultimately been that I was unable to perceive the ferry as such. I had the vague impression of a large building being in my way, preventing me from getting to the ferry, when it was, in fact, my destination. By the time I finally figured that out and got into the terminal just in time to board, I was soaked in sweat from madly running around the docks for over an hour in my overly warm traveling clothes. Despite its size, the ferry was not a cruise ship, but just a ferry: a large vessel for transporting large vehicles with a few amenities for the drivers of those vehicles. My single cabin with an outside window was a nice retreat, even though the view from the window was almost completely blocked by a large, high-tech lifeboat, and I was happily ready to spend the next twenty hours there. The only problem was that I woke up freezing in the middle of the night, and although I found extra pillows, there were no extra blankets, nothing to help me feel even a little bit warm so that I could sleep. That definitely put a damper on my ferry trip that I had been so looking forward to, but I was still happy to be on the ferry and not busily changing trains somewhere in the south of France. Nevertheless, the twenty hours passed surprisingly quickly, and the ferry pulled into the harbor of Barcelona just before eight in the evening. Since Patrick has not had a telephone for almost four years, I had sent him a reminder a few days earlier that he needed to be there to pick me up, because I otherwise had no backup plan. And as I came off the ferry, he was standing right there in front of me, before I could even start to look for him. His dog V was with him, of course, and V was so delighted to see me again that I forgot all about feeling cold and just felt loved. The factory colony around a textile factory built in the nineteenth century was a capitalist invention designed for maximum exploitation: since the factory was in a remote location away from other towns, far removed from urban centers, the people who worked there lived in the workers’ quarters there and spent what little money they earned at the factory shop. There was even a church in the colony, so that people went to the factory to work, but then the factory took over their entire lives. What is left now are ruins, rubble, refuse, and one of the most heavily polluted rivers in Europe. This is what the people who live there now work with to build a new way of living, based not on exploitation, but on self-responsibility and cooperation, a different way of “being-with”. To me, this is what makes Calafou such a hopeful place. I am not optimistic about the future. I believe we are faced now with capitalism beginning to implode, making it all the more urgent for us to be able to imagine alternatives. What can we build from the ruins and the rubble? How can we find new ways of doing it together? Calafou gives me hope that we can. This is one of Patrick’s favorite spots. I cannot imagine a better place for Patrick to have ended up in. Although my Spanish is extremely limited and I don’t understand Catalan at all, I can still read body language, and I loved hearing the way people say his name there. He lives among good people. 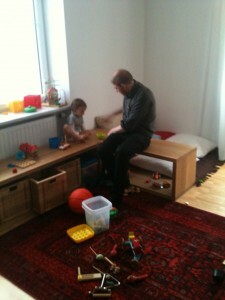 He still has a lot of work to do on his little flat in the former workers’ quarters, but it feels just right. Lionie is happily enthroned on top of the bookshelves, and everywhere there are reassuringly familiar objects: dishes from Oma, my old pots and pans from Innsbruck, pictures, books, the tables he made originally for his van. Patrick again has a home now. And he is learning so much! That doesn’t mean his travels have ended. He is making plans for further journeys, and he still gets by as a street musician during tourist season all around southern France, Spain and Portugal. When he sets off now, though, he is not just setting off into the unknown with no plan or destination. Now he has a place to return to. After feeling so cold for twenty hours on the ferry and driving from the port back to Calafou in a horrendous storm that washed out the street into the colony, I was feeling ill and quite miserable the first day, so I sadly missed watching Patrick take his turn at bar duty the first evening. After that, though, I decided that my visit was too short to waste it lying around in bed feeling miserable. Since I was self-employed for twenty-four years, I have more than enough experience doing the “I don’t have time to be sick now” thing, so that’s what I did. With some rather dubious cough syrup that someone found, lots of aspirin and copious amounts of ginger and lemon tea (I detest the taste of ginger, but I was that determined), I managed to largely suppress being ill, so that I didn’t have to miss out on wonderful evening-long conversations with Patrick and his inspiring neighbors (accompanied, of course, by plenty of wine and cigarettes) or forays into the surrounding area with Patrick and V. It was a bit strenuous, but absolutely worth the effort. Now that I’m over sixty, I get a discount on Interrail passes. Since I’ve never been particularly good at math, I probably ended up spending that discount multiple times over during my travels in October, but I don’t regret the costs at all. During two weeks in October I had the privilege of visiting three different worlds, and even though I was sick and broke by the time I returned home to Linz, being able to visit these worlds was absolutely worth it. When I arrived at the station in Bologna, my friend Helen was waiting to meet me and take me to the flat we were to share with three other friends for the week. I’ve been living alone with my cats for nearly seven years now. Sharing a flat with four entertaining flatmates as though we were young college girls again was so much fun. The Eclectic Tech Carnival (/etc) has always been my world. It brings together everything that I love, that matters most to me. It is a celebration of the ideals of Free Software, a respectful, non-commercial Internet, activism and creativity and endless tinkering for the good of a broken world, and it is a feminist space, a space to explore, learn and just breathe and feel accepted. After co-organizing the /etc 2007 in Linz, I had the pleasure of writing a longer essay about the history and background of the /etc for the online journal Transversal, “Things Can Break”, because it means so much to me. We had not held an /etc for several years, and it seemed that perhaps our time had ended, but as more and more women expressed a need for another /etc, a small group of us met earlier this year in Brussels to explore the possibilities, and when the possibility of holding an /etc at the social center XM24 in Bologna in October emerged, it seemed a perfect opportunity for me, offering everything I wanted to do with my new retirement. Since the process of becoming retired turned out to be a bit more complicated than I had expected, I was not able to be as much involved in the preparations as I had hoped, but the women from XM24 were so dedicated and energetic and other women involved in past /etc’s were able to be so supportive that everything came together wonderfully. It was exactly what I had been wishing for, what I needed most, and I am still deeply grateful to everyone involved in making this happen. Although we have always adhered to certain core principles, every /etc is different, because every organizing group is different, every location is different. The conditions, possibilities and opportunities are always different, and this combination of difference and recurrent themes and principles is always fascinating. Of course that was also true of /etc @ XM24. Following from our more intense online contact with the women of XM24, it was a bit surprising (for me, at least) that XM24 turned out to be such a palpably male-dominated space. I found myself wondering sometimes whether the Left has really learned nothing since the 1960s, whether even the most idealistic, progressive cis-hetero men will ever learn to critically reflect on the many ways they occupy too much space. Until they do, those of us who are not cis-hetero males are still stuck with the problem of trying to claim, define, defend, occupy spaces for ourselves in different ways. In the 1980s and 90s it still seemed to make sense to create women-only spaces, even though I have meanwhile learned to understand, as an old (white, cis-hetero female) feminist, that we inadvertently created other mechanisms of exclusion, which were not intended and which we now have to learn to rectify. 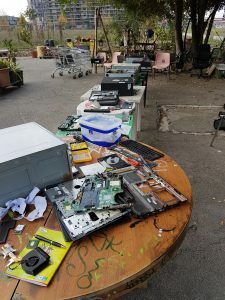 For ten years now, the Eclectic Tech Carnival has been grappling with the problem of naming who is invited into our space and who is not, and at /etc @ XM24 it became evident that we have still not quite solved that problem yet. In Brussels we came up with the self-description “We are a collective body of feminists with a particular history, chewing on the roots of patriarchy”, and I felt certain that must be sufficient, but apparently not. One of the men who joined us was clearly in the right place, a beautiful wounded soul certainly in need of the kind of “safer space” we have been working to create, and he was very sensitive to contexts and situations, understanding when he was welcome to join the conversation and when it was time for him to go and find something to clean or help prepare food. He understands the need for these kinds of spaces and he even understands how to help make them. Another man, who had come with his partner, also proved to be supportive and unobtrusive, and despite my initial skepticism, I was happy to see that it was working with him. A third man took part in one of the first workshops marked as “mixed” (“non-mixed” = women and LGBTQ only) and gave us an outstanding demonstration of why we have always sought to exclude cis-hetero men with their typical behaviors. Although I’m not sure he was even intentionally in the room (I thought he might have been a local who was asked to help with a connection problem and just stayed out of curiosity), almost as soon as the presentation about VPN began, he started interrupting, playing the old, boring game of pretending to ask questions in order to show off his own technical knowledge and undermine the speaker’s authority. In conversations later, it turned out that many of us were immediately irritated, but hesitated to tell him to shut up, because the speaker was doing such a great job of shutting him down herself. Finally one of the younger women sternly asked him to keep his detailed questions for a private conversation with the speaker later, because the rest of us wanted to hear her presentation. I had the impression he seemed a bit startled to realize that nobody in the room was even remotely impressed and managed to keep his mouth shut after that. The fourth man who, for some incomprehensible reason, felt addressed by our call for participation, turned out to be the epitome of the type of people I personally want to keep out of our space. I’ve seen this type so many times before, they always irritate me, and I’ve tried so many times to describe what these guys are like and why I don’t want them in my space, even though I don’t usually object to them in other spaces. Often they wear skirts or make-up or pigtails, exhibiting external markers of being “not like other men”, but beyond these external markers they exhibit exactly the same behaviors as more traditional men, whether they are the more open-minded “helps with housework” types or clueless machos: they have the same insatiable need for female attention. And because they present themselves as feminists, allies, whatever, they get that attention and end up having a decidedly divisive effect. Just before I left Bologna, I was very unhappy to find myself arguing with a young woman about this fourth man, when we had so many more important things to talk about. She took the position that we have to be nice to allies, welcome them and help them learn. I hated hearing the anger in my own voice as I argued: “But he’s not. He is not listening, not learning, not interested in anything we have to say; he’s just wandering around looking for someone to listen to him, and all his so-called contributions are essentially no more than mansplaining in a wheedling voice!” Men like that are one of my personal pet peeves, because it invariably infuriates me when they so often succeed in monopolizing women’s attention that would be better focused elsewhere. Maybe we need to move away from gender identities and focus more on the learned behaviors. The particular space of the Eclectic Tech Carnival is so valuable and important to me that I simply cannot surrender it to needy men. Yet despite these unresolved problems, the Eclectic Tech Carnival in Bologna was inspiring, motivating, wonderful and rich. The full program offered everything I could have hoped for: workshops and presentations on security/encryption, Free Software, feminism, programming, managing online identities … I was able to fill in some of the gaps I had been stuck with and find new starting points for further explorations. As one person said in our closing assembly, she appreciated an opportunity to present a topic she is extremely interested in, even though she doesn’t know everything about it. I felt the same way about my workshop on the history of Linux, as I had been feeling overwhelmed and insecure about the details I don’t have a firm grasp on, but it turned out to be enough to move into a fantastic conversation at the end about a “future feminist history of Linux”, a history that I seriously want to help write. And we are not finished: there is a strong drive to continue and to have another Eclectic Tech Carnival in yet another different place. The interest and enthusiasm of the many young women taking part in an /etc for the first time was a powerful affirmation that this still matters and we still have much to share and learn and work on together. In the end I left with my bag full of stickers, folders, copious notes, and my head filled with ideas and inspiration. It was everything I had hoped for. The story continues with Part II. Depending on the choice of milestones, I entered a new phase of life in March, in April, in May or in June. In other words, this has been an ongoing process, and now at the end of July I am still trying to figure it out. The first milestone was my sixtieth birthday in March, which I wasn’t particularly interested in celebrating, because I was still desperately trying to finish work and I couldn’t possibly afford more than an extra glass of wine at that point. Nevertheless, I quickly realized that being a woman over sixty is actually a lot more fun than any other age I have experienced yet. I feel as though I have joined a secret club with the motto “I have no fucks left to give”. I don’t have to prove anything, I don’t have to please anyone, I don’t have to make any choices that will affect my whole life. I have already made all those choices. I find being a woman over sixty surprisingly liberating, although I am well aware that I clearly speak from a position of privilege. Recognizing that I have a very good life, though, I want everyone else to have a good life too, so my next goal is to find meaningful ways of contributing to making that happen. Following my sixtieth birthday in March, the social security agency officially recognized me as a pensioner on April 1st and granted my claim to an “old-age” pension of my own (“Alterspension”: it’s actually officially called an “old-age pension”), not just the widow’s pension I have been receiving since Peter’s death. Now I have the card and all. But in April I still wasn’t finished working yet. I had already turned in the forms to cancel my business license after April 30th, but until then I kept working and managed to finally finish the last of the translations for a book I’ve been working on since last summer (although I still owe them the final revisions), and I translated the Crossing Europe Film Festival Linz for the fifteenth and last time. In 2004, after the last opera production in Wilhering, Crossing Europe became our “family project”. While I took care of translations, Peter took responsibility for system administration, and the boys just did whatever was needed from them. When I checked the first festival catalogue from 2004, I even found the name Christopher Derieg Hütmannsberger on the long list of people thanked for their support, although no one has any idea now what Christopher might have done at the age of 13 to earn being credited in the catalogue. We joined the Crossing Europe family and Crossing Europe joined our family. Even when I had to continue our family project without Peter, I didn’t have to do it alone. With all of that, translating Crossing Europe for the last time as my last ever translation job turned out to be a bit more emotional than I had expected: step (for the last time) by step (for the last time) by step (for the last time) until I wrote the last bill (for the last time) the day my business license came to an end. Finished. For the first time in twenty-four years. First there were bills to pay, taxes and social security for the first quarter of the year (for the last time), things that needed cleaning and sorting that I had had to just ignore throughout April, regular payments to be transferred from my business account to my private account. 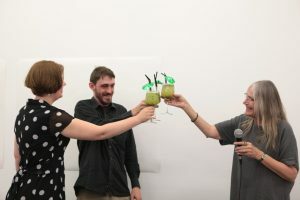 There was the wonderful “Art Meets Radical Openness” festival, helping celebrate Christopher’s twenty-eighth birthday in Vienna with wonderful readings and concerts he helped organize – the first month of “freedom” flew by so fast I could hardly keep up. Then June came. After submitting the application for retirement in September 2017, I started making a long mental list of all the things I would enjoy finally being able to do once I finally retired: cleaning up all the computers and installing a different version of Linux on each one, learning about non-commercial alternatives on the Internet, working on websites, deep-cleaning and renovating the flat, sewing, writing, answering emails, writing, reading, reading, reading … None of those things really happened in June, except that I finally signed up for Mastodon (anyone on Mastodon, please find me @aderieg@post.lurk.org) and worked my way through the first 200 pages of my new 1500-page Linux manual (I think I’ve finally grasped efi, but I still need to work on partitioning). What I did achieve, however, is that I finally paid off the last of my debts to the bank left over from trying to keep the Workshop going for three years. “Debt-free” is a very special kind of freedom, for which I am now deeply grateful. What also happened in June is that I “officially” handed my work as a translator over to Christopher and my colleague Laura Freeburn from the US. I needed to do that, because obviously I am still a feminist theologian at heart, so I needed a ritual with symbolic actions and witnesses. Although it became apparent that I hadn’t done a very good job of “delegating” various tasks, I was happy with the way everything turned out in the end, especially thanks to Susanne Blaimschein, Erwin Franz and Rebekka Hochreiter (better known to my international family simply as Becky). 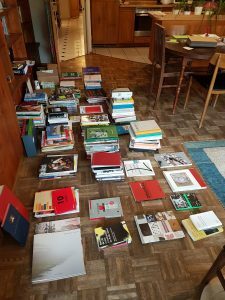 For the “handover” I spent an entire weekend gathering together and sorting through all the books and artifacts documenting my twenty-four years of work as a translator. 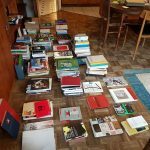 The material remains of 24 years of translation work, moved from the shelves to the floor. These were then all transported to Kunstraum Goethestrasse, where Becky arranged them beautifully on tables (when Christopher saw them, he blinked and announced sarcastically, “No, that isn’t even slightly intimidating!”), in between hanging up postcards from “my” authors and other cards, invitations and announcements I used to have on the doors of my office. To the many words, to the other words – to all the words. My one special wish for that evening was for both of my sons to play a small concert for me, and after they granted that wish, I was finished: after that nobody wanted to talk about anything other than how amazingly talented my sons are. I had the impression that Christopher seemed to be relieved to be back on more familiar territory, on stage, holding his own mic and performing his own work. I was surprised and touched, though, when Patrick started his set by pointing out that while Christopher is taking over my work as a translator, Patrick is taking up a different strand from my life with his wandering. I am still grateful to him for pointing out that while translating was my job for twenty-four years, it was never my whole life. So where am I now at the end of July? In between sorting books back into the shelves, long conversations with Patrick, occasional long walks with his dog, closing my business account, paying the last of my taxes, Death Cafes in May, June and July, still working in between on the last revisions of the last texts of the last book, watching Patrick set off on his way back to Calafou with three humans, two dogs and a lot of luggage in a small Hungarian car, washing sheets and towels (apart from brief intermezzos I have had a full house with a steady stream of visitors since Crossing Europe), just basic cleaning, responding to Christopher’s requests for help or advice, sorting through fabrics and patterns … I haven’t really even started yet with my to-do list for retirement. What is fundamentally different now, though, is that nothing is urgent. There is nothing I have to do right now or have finished by tomorrow morning at the latest. It will probably still take some time to grasp this new rhythm of life, but that’s okay. It seems I have now reached that stage in life, where having both my sons here at the same time has become such a rare and important event that it supersedes all other claims to my attention. “Home for Christmas”: yes, we have become that trite and clichéd, and I won’t even try to deny it or attempt to frame it differently. Patrick arrived from Catalonia by way of France somewhat earlier than I expected him, before I could even go completely to pieces worrying about him driving in winter (although I felt compelled to remind him to be careful because Germans don’t know how to deal with snow on the roads). As in August, he arrived with his traveling companion V (or Vie in French or Wie in German), the most adorable dog in the world. I was delighted to see them both, although my cats were considerably less pleased about welcoming another companion species into our lives and living space. Then Christopher arrived from Vienna on Thursday before Christmas, so that we could drive out to the Megaplex at the edge of the city to see the new Star Wars film together, following what has meanwhile become another family tradition. On Friday Christopher thoughtfully offered to help me with the weekly shopping, since I would need to buy more for the holidays and would probably need help carrying it (especially the extra beer). The supermarket was a complete madhouse, of course, just before the holidays and with the prospect of no one being able to do any shopping for three whole days, since the twenty-fourth was a Sunday this year, but that was to be expected. Somewhere in the midst of the mayhem, somewhere in the middle of the juice and soft drinks section, it became clear that Christopher’s offer to help me only extended to helping me carry things home, not to helping me figure out what to buy. While I was trapped with the shopping cart at one end of the aisle and Christopher was on the other side of a large crate blocking the way, I tried to persuade him to pick out some kind of fruit juice, but Christopher, with an expression of alarm on his face, resolutely and verbosely denied any and all knowledge of the concept of fruit juice and especially of responsibility for fruit juice. As we debated fruit juice, decision-making and the nature of “help” from opposite sides of a large crate, out of the corner of my eye I noticed that the young man attempting to re-stock the shelves from this crate seemed increasingly amused. His amusement then spread to other people trapped between crates and shopping carts in and around the same aisle. I suppose being able to provide a little entertainment in the midst of manic holiday shopping is not a bad thing. After Christopher and I returned from shopping and began to recover, he continued in Very Helpful mode and announced that he would cook lunch for all of us (“lunch” being a rather nebulous term at three in the afternoon). It really was a very sweet offer that I was happy to accept, even though it soon necessitated a major revision of my plans for the day, because as soon as he stepped into the kitchen, he started channeling his father. Just like Peter, Christopher in the kitchen enters into his own idiosyncratic bubble that follows its own laws of space and time that are clearly unrelated to any other laws of space and time. Negotiation is out of the question. Between Christopher channeling Peter in the kitchen, Patrick perpetually busy doing something or other requiring his full mental attention and frequent mumbling, dog and cats negotiating barely tolerable interspecies coexistence, and me with intended Christmas preparations that seemed incomprehensible or at least irrelevant to anyone else – we were right back in our old life together. It felt so familiar that I wasn’t even conscious of it, until we got to the cemetery on Christmas Eve in the late afternoon. It was almost jarring to look up and see Peter’s name on the marble plaque, and I realized then that I had had the feeling for days that he was just in the other room, just as he had always been when Christmas preparations disrupted his normal routine. Peter has been dead for six years now, but with the boys at home, it almost felt as though I had forgotten. But he is not just in the other room, staying out of the way: he is, in fact, dead. That hit me again on Christmas morning, when I got up to make coffee and found the stockings filled and beautifully arranged with a few little presents around the tree. It was so lovely and so unexpected that I just stood there and started to cry. And with the tears, memories came rushing in of what Christmas used to be like at our house in years past, when Peter was still alive and we could afford to surprise one another with generous presents. Although Peter always had difficulty coping with anything that disrupted his normal routine, he was a most generous and magnificent gift-giver. 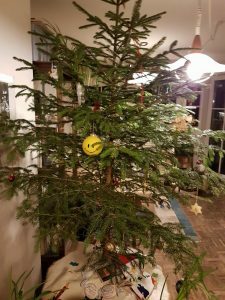 And when we were two parents, we shared the pleasure (and the organizational responsibility and the costs) of choosing presents for our children, for the whole family. Wrapping presents was mostly my responsibility, while Peter’s gift-wrapping attempts were mostly hilarious. Now it almost seems funny to remember how we thought we were being so restrained and anti-materialist about gift-giving, valuing the thought over the price of each gift. We could afford to think that way when Peter was still alive. By myself now, I have a very strict list for Christmas. For our Austrian Christmas with Peter’s family on Christmas Eve, I pick out one book for each person – and thinking intently about each person to pick out exactly the right book gives me great pleasure – and on Christmas day we only do stockings, which are filled with chocolates, a package of cigarettes, a miniature bottle of alcohol, a lottery scratch card and more chocolates. That’s it. That’s all I can afford and all I can organize by myself. Since the most important part of Christmas now is the annual gathering of friends, I’m happy with my new traditions. This is my life now, and it is a good life. Christmas at our house was different when Peter was alive, and becoming conscious of that difference can sting sometimes. But that was then, this is Christmas now. And although I’m not sure how I became that kind of mother (or even how I quite feel about it), having my sons home for Christmas is now the very best present possible and all that I could wish for. This year Amy keeps an eye on what’s going on in the kitchen. New Year’s Resolution: Stop being so maudlin! I hate it when my role models die. When I heard the news that Herlinde Pissarek-Huddelist died, I packed up my children, took them to the playground, and then completely ignored them as I sat on a bench on the side, smoking one cigarette after another as memories welled up. I was lucky the boys were past needing constant supervision by then. When Johanna Dohnal died, I stopped working and decided to clean the kitchen to keep moving in the face of a huge wave of memories. I was so far away in my mind that I didn’t immediately notice when I caught a loose piece of wicker from a basket under my fingernail, but eventually the whole fingernail had to be removed to get it out, and then the wound got infected on top of that. Attempting to write at least a few lines to add to the tributes to Johanna Dohnal thus became quite laborious and physically painful. When Natalie Magnan died, I started pacing frantically back and forth from one end of the flat to the other, but all I really wanted to do was curl up on the floor and howl like a frustrated toddler: “Noooooo! I still neeeeeed her! !” I was so distraught by the realization that Nat and I would never laugh together again, I didn’t even know what to add to the tributes and memories that started cropping up all over the Internet. 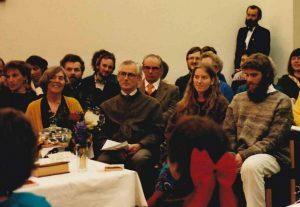 Although my brother had told me about June and Michael Lawlor before, the first time I met them was when they generously came to our wedding on 31 December 1986 to stand in for my parents, who couldn’t make it to Austria. This time, though, instead of just disappearing into my memories (and risking physical injury by becoming detached from my material surroundings), I decided to go to Kemble for the memorial. It turned out to be exactly the right decision, but also in ways I had not expected. After telling any number of people in Linz enthusiastically about June, to explain why I needed to go to England for the memorial of my brother’s mother-in-law, as I was preparing to travel I realized I had not been back to Kemble since before Peter died, and we always drove (and argued all the way). In the end, I managed to make sane and sensible travel arrangements for myself alone, despite the vagaries of British public transportation, but I was annoyed that I found myself missing arguing with Peter again. Missing arguments with Peter is still one of the most disconcerting experiences of being a widow, I find. But I got there, Jim met me at the train station in Kemble, and we walked together from there to Tralee, June’s house, where I was generously given June’s room to stay in for the weekend. Although I knew that June had eventually sold Forge House some time after Michael died and moved to a different house, Tralee surprised me. June’s presence was still strong and comforting in the house, but all the different pictures and reminders of Michael in different places reminded me of how long June had lived as a widow too. Little notes posted in strategic places were a poignant indication of the experience of dementia in the end, but one of them, a note from June’s brother Wilf, struck me most powerfully: Wilf had written about how June had managed to bring the spirit of Forge House to Tralee to create another very special place. The note was hung up in the kitchen, as though June needed reminding of that herself at the end of her life, especially as it was placed in close proximity with her name and date and place of birth. Three strangers staying the weekend at Tralee quickly formed a small, temporary community as we shared our stories, exchanged memories of June and her family, and found our way into taking over small responsibilities for preparing the house and garden for some eighty visitors who came to the memorial on Saturday to celebrate June’s life. Listening to all the ways June had touched people throughout her life was inspiring, motivating – and exactly what I needed at this point. This past half year, it feels as though I have been struggling to resist feeling overwhelmed by a sense of loss. The Workshop is gone, and now I’m just working to pay taxes retrospectively for the extra money I had to earn to keep it going in the end. I’m tired of translating, I’m tired of working with English, I don’t feel I’m doing a good job, and working only to pay taxes for something that’s gone just feels defeating. The greatest turmoil after Peter’s death has calmed now, and no one I am responsible for is currently in an emotional crisis. No Workshop, no one to take care of – what am I doing? What do I even have left to offer? What can I possibly contribute to making the world at least a little bit better, at least in the little world I live in? It surprised me how much less useless I felt at Tralee, but I came home feeling inspired, motivated, strengthened. For that, I am so deeply grateful. “She whom we love and lose is no longer where she was before. Christopher leaving Linz wearing his father’s smile. Yesterday Christopher flew to New York with Peter’s last instrument. Everything went smoothly, and both Christopher and the instrument arrived without mishap or complications. The instrument is now in good hands, and it will be played, heard, appreciated as it should be, and Christopher is set to enjoy a few days in New York and then a few days in Michigan with his cousin and my sister’s adorable little granddaughters, celebrating Amelia’s first birthday only a week late, just a year after I was there to welcome her into the world. So theoretically it’s time for me to breathe now, unwind, pick up the pieces and put myself back together. What hit me? I think perhaps I just wasn’t prepared for all the memories and associations and emotions that getting the instrument to New York triggered for me, and I ended up feeling more than a little overwhelmed. As Christopher and I walked calmly to the tram stop yesterday morning to get to the train that would take him to the airport in Vienna, in my mind’s eye I kept seeing Peter dashing madly down exactly that same street with a large viola da gamba in one hand, a large suitcase in the other, just barely in time to jump on the tram, but without time to buy a ticket first, so all the way to the train station, he was prepared to explain to a ticket controller that he would be happy to jump off and buy a ticket, if only someone would hold the gamba and the suitcase and keep the door open for him … Peter had to be on exactly that tram in order to just barely catch the last train that would get him to Vienna in time to just barely catch his flight to Australia. It was so quintessentially Peter to cut it that close. As much as Christopher physically resembles Peter, I was very grateful yesterday that he is different enough in character to insist on leaving the house in good time to easily get him to the train station with enough time to enjoy a cigarette before the train arrived that would easily get him to the airport with plenty of time to check in and go through security and probably enjoy another cigarette somewhere in between. 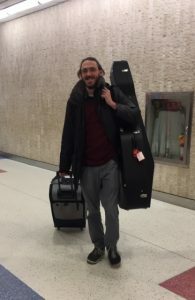 Walking down the street with Christopher and the instrument, my mind was flooded by memories of traveling with Peter, two small children and at least one, if not two large instruments. Between my need for extra time to get my bearings and Peter’s phobia about ever having to wait, traveling together was never anything but extremely stressful. In all the years of our life together, I don’t think we ever got to an airport without both of us being absolutely livid and barely on speaking terms. I don’t think we ever reached a ferry on time. We argued about packing, we argued about arrangements, we argued about how much time we needed to get from point A to point B, we argued about Belgium: as many times as Peter drove from Linz to the UK, he seemed to forget every single time that once you drive all the way through Germany, you still have to cross all the way through Belgium to get to the ferry, and although Belgium is a small country, it’s not that small. I remember Peter shouting out the car window, “What is the point of Belgium? !” and me seething in the passenger seat, “I told you we should have left earlier!” We argued about tractors: Peter invariably insisted that unless there was a tractor on the road, we would easily get to the airport on time, and I invariably insisted that there was always a tractor on that road to the airport. He was incapable of quietly standing in line and patiently waiting for further information. He always had to try something else and I always had to question his sanity. In all those years of mad traveling escapades, I would never, ever have even dreamed how much I would some day miss that, all of it. Traveling without Peter is certainly much more calm and sane, but I miss the adventures, I miss the surprises. I miss the unexpected arrangements Peter was able to make, which really shouldn’t even have been possible and were probably against regulations – some regulations somewhere, as the statement “I’m sorry, sir, but that’s against regulations” seemed to become almost a familiar greeting, whenever Peter was in the US. Life with Peter was not always easy, but it was never boring. I can cope on my own now, of course I can. It’s just not as much fun. And somehow I missed mentally preparing myself for what this instrument – “La Ultima”, as a friend called it – would mean to me, how many memories and emotions it would evoke. This was the last instrument Peter was working on when he died, a Stainer gamba, but it wasn’t quite finished. Thanks to an introduction from Bernhard Costa, Claudia Unterkofler came to Linz, collected all the work Peter had done on the instrument along with his plans and notes on Jakob Stainer, and finished it. I was grateful to be able to pass on Peter’s work on Jakob Stainer to a talented young woman, who had already been in correspondence with Peter about his work on Stainer, so that she can continue it with her own work. When I heard the instrument played for the first time, it felt like hearing a farewell from Peter at last. The last conversation that Peter and I had was about his mother, how worried he was because she was so ill and in the hospital, and I promised him then that I would look after his mother until he returned. Peter never had a chance to say good-bye to me until Claudia finished the instrument and it was played for me, but I heard him then. Hearing the instrument played the afternoon before Christopher took it to New York reminded me at the same time of another instrument, though, a very special gamba that Peter made in 1988. 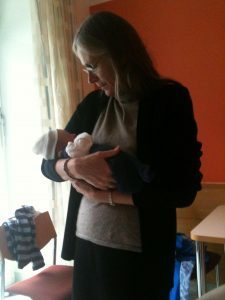 When I was pregnant for the second time, when we were reassured that it was not another ectopic pregnancy and everything was fine, Peter and I were overjoyed. We were certain that by Fall we would have a beautiful baby daughter, and we already knew her name. In this feeling of euphoria, Peter wrote her name on the inside of the instrument before he put the top on it and dedicated it to her. Then, just at the end of the first trimester when everything seemed fine, one day her tiny heart just stopped beating and the pregnancy quietly ended in emptiness. After the nearly fatal ruptured tubal pregnancy the year before, Peter had been too busy keeping me alive to be able to mourn the loss of the baby we had hoped for, but his sense of loss was that much greater this second time. I remember watching helplessly as he worked obsessively on that instrument, pouring all his grief into it and his fear that we might never be able to have children of our own. I remember hearing the instrument being played for the first time, around the time the baby would have been born, and as the tears streamed down my face I thought that even though our baby didn’t live long enough to be born, she still has a voice, an incredibly beautiful voice that will live on. At some point – last year, the year before? – Patrick remarked that there is another symmetry in our family now: Peter is with our daughters, and our sons are with me. I don’t know where our daughter’s gamba is now, since Peter and the musician who had it came into conflict years ago, but now I like to imagine it might show up again someday and end up being played together with Peter’s farewell gamba. It’s a lovely fantasy at least. After he arrived in New York, Christopher wrote to me that everything went remarkably well on the journey. 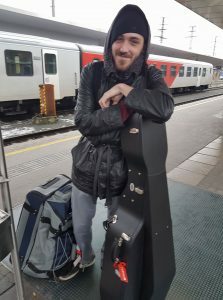 Far from being a burden, the instrument seemed to make everything easier, as people were especially nice to him, let him board the plane early, made an effort to accommodate him with the instrument. I suggested he should thank his father for that. Getting the instrument ready to travel, I thought several times that it’s a good thing I don’t allow ghosts in my house (as I sternly informed my mother in a dream some time ago, when I ordered her to get out), or Peter would have been driving us all mad. I had the feeling he wanted to keep tweaking the instrument, polish the varnish here, turn the peg there, check the soundpost again … Would he have been satisfied with the instrument? Certainly not: Peter was never satisfied with his own work. Of course he wasn’t – nobody gets to be really good at what they do by just being satisfied, and Peter was certainly very good, even though he couldn’t allow himself to think so. That leaves me feeling highly conflicted, though. Have I done everything I possibly could to ensure that this last instrument proves to be a credit to Peter’s legacy? I’m not an instrument maker, not even a musician, which means that my possibilities for intervention are severely limited. I have had to depend on other people, knowing all the while how much Peter, being the control freak that he was, would have hated that. But the hard part about being dead is that you can no longer change anything in your life, you have to let other people do it for you. Christopher arriving in New York wearing his very own smile. I am reminded of a very moving statement by a young woman at a Death Cafe in Linz some months ago. She described her conflicted relationship with her father, but said she often talks to him since he died, and then she smiled and said, “He has learned a lot since he died.” Peter did not finish his last instrument himself, and having to take over the responsibility for it has always made me feel terribly insecure, worried that he would not be happy with my choices, with the results, and watching Christopher leave with the instrument seriously exacerbated my insecurity. So I hope that Peter has also learned something since he died and that I have as well. This is about letting go. The rest is not up to him or to me. Clocks display numbers marking the passing of time, the hours, the minutes, the seconds, the arbitrariness of which is most evident this time of year, when we have to change all the clocks, and various clocks confusingly display different times for a while. Calendars display numbers marking the passing of days, weeks, months, years, but they cannot capture the moments marked by emotions. There is a more concrete, more palpable, more emotionally appropriate measure, though: How tall Oscar is, is how long Amy has been dead. A week or so later, I was pleased to see Oscar again, when he spotted me standing near the bar outside at Solaris one evening and told his father he wanted to say hello. I feel pleased and deeply touched that he seems to feel connected to me, even though he doesn’t remember why. I asked him, but he doesn’t remember promising me five years ago that he would always tell me what is really important. Nevertheless, he has always kept that promise. For three short, long years he was such an important person in Peter’s life, and it was a joy to see them together. I think – or perhaps simply hope or just imagine – that feeling is what keeps us connected, but I am grateful in any case that the connection exists. How tall Oscar is, is how long Amy has been dead. Amy would have been fifty this week, and I can only imagine how much fun it would have been to tease her about it, just as it would have been fun to tease her about becoming a grandmother at the age of only forty-seven. We celebrated what would have been her forty-seventh birthday by bringing her newborn granddaughter home from the hospital that day. Her granddaughter will celebrate her third birthday this week. Time passes, children grow. My little neighbor from upstairs comes down to visit me. Only a moment ago, her mother was worried that she wasn’t walking yet around the time of her first birthday, but now she walks down the stairs by herself, holding her soft stuffed rabbit in one hand, a wind-up mouse to entertain my cats in the other. She is a few months older than my sister’s first granddaughter, so she is already three. She goes to kindergarten, where they have been making lanterns for the lantern procession on St. Martin’s Day, and she can sing the lantern song beautifully. And she has so much to tell me, I can hardly keep up! But as I listen and we pet the cat together, I feel the moments slipping away too quickly, far away in Michigan, where Amy’s meanwhile two granddaughters are growing up with the understanding that “visiting Grandma” means taking a trip to the lake, where grown-ups then stand oddly sad and silent for a moment. Only a moment. In less than two weeks it will be five years since Peter died. Two months after that, George will celebrate his fifth birthday. George, my first “borrowed grandchild”: How tall George is, is how long Peter has been dead. Frantically, I try to remember when I last saw George, and I worry he will forget me, if I can’t get myself organized enough to spend time with him at least once a month. I have no sense now of how long or short a time five years might be. I cannot account for the moments that have passed since the policeman came to my door. Sometimes it feels a lifetime ago, sometimes it feels like barely an hour has passed. Were it not for George growing, I would have no measure for how long I have lived as a widow. Perhaps it doesn’t really matter though. In the end, Oscar, Evelyn, Lisbeth, George, Amelia and all the other children growing are the only measure that matters, the only measure that even makes sense at all.